Is your garden producing buckets of fresh green beans yet? 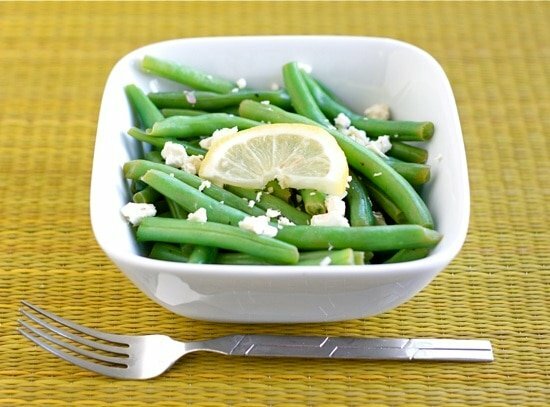 If so, you have to try green beans with lemon and feta cheese. 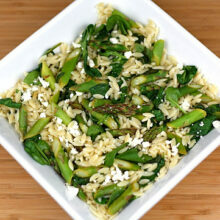 This easy side dish is great with any meal. One of my favorite summer chores as a child was prepping the green beans for dinner. I really didn’t consider it a chore, but since it was a job on the list, I always signed up:) I loved sitting outside on the patio with a big bowl of fresh green beans. I always kept a spare bowl by my side, to toss the ends into. I don’t know why, but I enjoyed snapping off the firm ends of the beans. I would get sad when the beans were all snapped and ready to go. The bigger my bowl was, the better. I still enjoy snapping beans and I enjoy eating them too. I like my beans crisp, bright green, and a tad crunchy. This time I spiced the green bean up with lemon and feta cheese. Light, healthy, and delicious. If you love garden green beans, get a big bowl and start snapping. 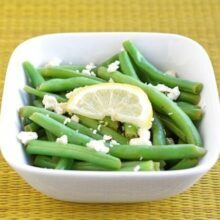 You will love these green beans with lemon and feta cheese. 1. In a large skillet, heat the olive oil and saute the garlic and onion until tender. Stir in the green beans. Add the lemon juice and stir again. Place a lid on the skillet and cook the green beans until tender, about 5 minutes. Make sure you stir the beans at least once. 2. Pour the green beans into a bowl or onto a serving platter. Top with feta cheese and season with salt and pepper. Serve warm. *Note-I always squeeze additional fresh lemon juice on the green beans right before serving. You know I’m not the biggest veggie fan, but my husband would LOVE these! Green beans are his fave. 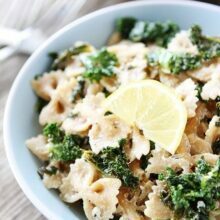 What a gorgeously simple dish! Love it! Ahh…memories of summer on the farm, snipping buckets of beans and shelling tons of peas! Didn’t realize how easy life was then! Green beans-a staple in our kitchen! I just picked a strainer full of green beans today. So for Sunday’s Lunch I will be making the green beans with feta cheese. simple and delicious. we should be picking some tomorrow. I love that you used red onion and feta. Just so happens I do have an abundance of beans in my garden! Sounds very good. I might add the lemon zest as well. I have all the ingredients and since I’m cooking for myself today and no one else here likes feta cheese, guess what I’m having for dinner? This looks so fresh and delicious. 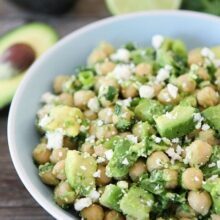 What a perfect simple side dish! I can never get enough feta. This recipe is simple and delicious – perfect for the summer. What a pretty and simple dish! We have had a lot of green beans from our CSA and it looks like we’ll have quite a few from the garden soon, as well. I will keep this recipe in mind! 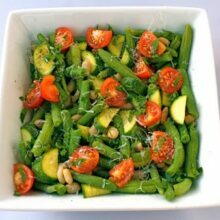 i’ve never tried green beans like this–how refreshingly different! Picked some beans and onions just minutes ago, going to make this for dinner! Simple vegetables. Love love love! does it have to be red onion or can i use white for the recipe? Try adding a little fresh dill at the very end too. Yum!